This week we visit Chattanooga, Tennessee and the Chattanooga Choo Chooand learn how to incorporate focal points into our gardens. Everybodylikes to make their garden special, something that draws attention,something that says "come on in." The Chattanooga Choo Choo has manywonderful gardens, full of focal points, their experts will show us howto create pizzazz in your garden with the use of fountains, specimentrees, even Day Lilies. Lori Martinez is the horticulturist. She tends 24 acres and tries tomake them pleasing for the guests. She does this, in part, by creatingoutdoor rooms. Lori uses trees and shrubs to block views, creatingstopping points, twists and turns. These areas cause people to stop, seethings up close, new views then lead them on to different areas. Creating a focal point is one of the qualities of a great garden. Oneway to create a sense of focus or a focal point with plant material isto use coarse leaves, leaves that are shiny, leaves that are far apart.They encourage the eye to look at that point. In one area Lori has usedElephant Ears, they make a bold statement, their large texture offsetssome of the smaller, more finely textured items in this garden. Lori hasused plants with intense colors in other parts of the garden toaccomplish this effect as well. Plants with variegation are alsoeffective in this regard. We next view an area with a stunning water feature, it really catchesthe eye. The fountain acts like an oasis in the middle of downtown. Thesoothing, calm sounds of running water provides a wonderful atmosphere.One feels 5-10 degrees cooler standing next to the waterfall. They haveseveral fountains in different areas. One is informal, a little girlwith outstretched arms, it seems inviting, almost asking one to comeover here and let me show you something interesting. In another areathere is another fountain, a gazebo fountain, it's domed shaped andcreates a nice arching splash of water. It adds some whimsy to anotherwise formal garden, a sense of balance. The water features arepurposely placed away from other water features so they don't compete.Dr. Rick feels that too many residential gardens have too many points offocus. It then becomes too busy, too confusing. Remember it's importantto set focal points apart from one another. A classical way to create a sense of focus is with a line of sight. Thisone is down the center of the different gardens. It is a walkway butalso provides a view through the entire garden area. The eye starts witha little boy fountain. He draws one to that room, to that space. Lorihas used color down low and fine textures around this fountain.Repeating arches also aid in attracting the eye to this area. Whentrying to create a very formal, very powerful focal point, this line ofsight technique is effective. Make sure not to use too many elementslike coarse textures, or other fountains in the same area. The objectiveis to draw the eye, to create a visual energy at one point, don't takeaway from that focal point. Lori likes to create rooms by creating walls with trees and shrubs.These are areas that can then be walked through. Specimen trees are alsoa good way to create this sense of focus. In this area Lori has utilizeda Kwanzan Cherry, it is beautiful. It has clusters of pink blooms in thespring, when blooming it certainly is the focal point. To add interestyear round Lori has wrapped the trunk and branches with outdoorChristmas tree lights. Beginning at dusk this tree comes to life. Lorihas limbed up the branches providing a better look at the handsome tree.It has a very loose, spreading, open habit. By limbing the tree up itexposes those wonderful qualities. Lori has made sure there is nothingaround the tree that would compete with it visually. Ivy makes a nicecompliment, adding a nice green carpet underneath. It does tend to growup the tree, but Lori throughout the year cuts the vines from the tree,it doesn't take much effort. To keep the lights from girdling the treethe lights have been loosely wrapped around the tree. Additionally thelight strands are periodically changed and adjustments for tree size canbe factored in during these changes. It's a great idea because itprovides interest at night when many things aren't visible. Junipers are the focal point of another outdoor room. One Juniper is aTorialosa another is a Fitzer. They block the view, thus emphasizingtheir form and create two rooms. They provide a very restful feelingalmost inviting one to come in and take a seat. Their fine texture ishelpful in this regard. Also the color green creates a soothing effect.They are Oriental in nature, not a lot of color or contrast but insteadprovide a nice blending. Another area has flags from different times of our country. The colorsare then repeated or echoed in a flower garden. The Petunia mix Loriused is called "Dreams Patriot" and it has done very well in thisgarden. It really does provide a sense of red, white and blue andcreates a wonderful focal point. Lori thinks this is a great time toshow off our colors. The bed is framed with "Dwarf Mondo Grass" andlooks similar to framing a flag. The Mondo grass grows very slowly andis virtually maintenance free. It doesn't require pruning or cutting,when it grows out of the bed Lori cuts it back. It's soft like a carpetand can be walked on. It's a great substitute for grass in the shade. A water garden is situated in the exact center of the formal garden. Itis elaborate with a lot going on. Although a formal garden it has manyinformal features, all tied together with bold textures and color - alot of action. It stimulates the senses - sound, sight, smell. Whencreating focal points rather than think about the focal point itself,think about making elements substantial. The pond in this case is verylarge, one could swim laps in this pond. The stone frogs spitting waterinto the pond are very large. By making everything larger than life itdraws people in, it pulls people to this space. Mulch is an unsung hero in most gardens. It keeps weeds down and adds afinished look. It is especially important in open spaces, areas where alot of ground is visible. Dr. Rick likes the color enhanced mulches.They provide a rich, uniform color throughout the entire season, yetlook natural. Select a color that matches the surrounding hardscape andarchitecture, that way it acts as a focal point, yet doesn't detract orcompete with the plants. When designing a garden think about how many plants to use. The numberof plants utilized effects a different feeling. For example if one plantis chosen it can be assumed it will be a focal point, it will bestanding by itself. Therefore if choosing only one plant, pick one withspecial qualities. A Japanese Maple is an excellent example. It says"I've got enough visual energy, I've got enough going on to standalone." When utilizing just one plant makes sure that you pay attentionto its' sphere of influence. In other words, don't place anything closethat would detract from it. Mulch or a fine textured border are ok. Ifusing two of anything make sure that they're placed at a point ofimportance, an entrance for example. They will create a sense offormality. Two Hollies are symmetrical, very formal. They say welcome,yet at the same time say it's an organized area. Utilizing twoHydrangeas or two Petunias provides a relaxed, welcoming, yet stillorganized feel. If you want to create an area that won't be a focalpoint and you don't want to create a sense of formality, then three isthe least number to buy. Put them close enough together so that theytouch or are massed together. This creates a sense of boldness, onecan't tell where one starts and one stops. If everything in the gardenis in groups of three it starts to look spotty, to look weak. So, varythe numbers, try to use an odd number if possible - three, five, seven -but three would be the least number to be utilized. When using an evennumber, whether plants, containers or spitting frogs in the pond you'resaying organization. By placing four separate containers in eachseparate corner it creates a little bit more organization and formality.By using even numbers - two, four or six - it creates a sense ofsymmetry and a sense of a well behaved garden. Too much can create astiff, overdone approach but a little here and there adds discipline andevery garden needs that. One design tip says always plant in oddnumbers. That is especially true if it's shrubs of size. Otto LukenLaurels look good if massed. When five are selected there are enough toput two or three in the front and two or three in the back. Staggerthem, getting a little more depth in the planting bed. When using an oddnumber, especially below seven, it creates a very informal look. Onecan't often tell if it is three, four or five. One may grow slow, onefast, one tall, the other short, it really doesn't matter because onecan't see the individual plants. Five is a good default number whentrying to create an informal, yet bold approach. Six of something can bea problem. A better strategy than putting six plants in a row is tobreak them up into groups of three. We've taken six Hollies, put threeon one side of the walkway and three on the other. This creates aninformal approach, a sense of balance and of symmetry. Because oddnumbers are being used it's more casual, more informal. So, whenever youhave six break it up into two groups of three. If you're worried aboutplanting plants in odd or even numbers pay attention to the numberseven. It's a critical mass, after seven the eye can't tell if there isan odd or even number. If concerned about planting in masses selectseven. These guidelines should be helpful when buying plants. If you want plants that are more than pretty consider ediblelandscaping. Consider Strawberries, as a ground cover, grapes and anarbor or consider Blueberries as a foundation shrub. They are a handsomeplant growing to about three or four feet tall. Blueberries produce abrilliant orange to red color in the fall. They provide several seasonof interest but the best part is being able to eat the Blueberries. Hemmerocalis means bloom for a day, hence the name Day Lily. At theChattanooga Choo Choo they have 184 varieties of Day Lilies. They can beplanted in any kind of situation from sun to partial shade and theytolerate any type of soil from heavy to organic. They bloom profusely,but the blooms only last for a day. 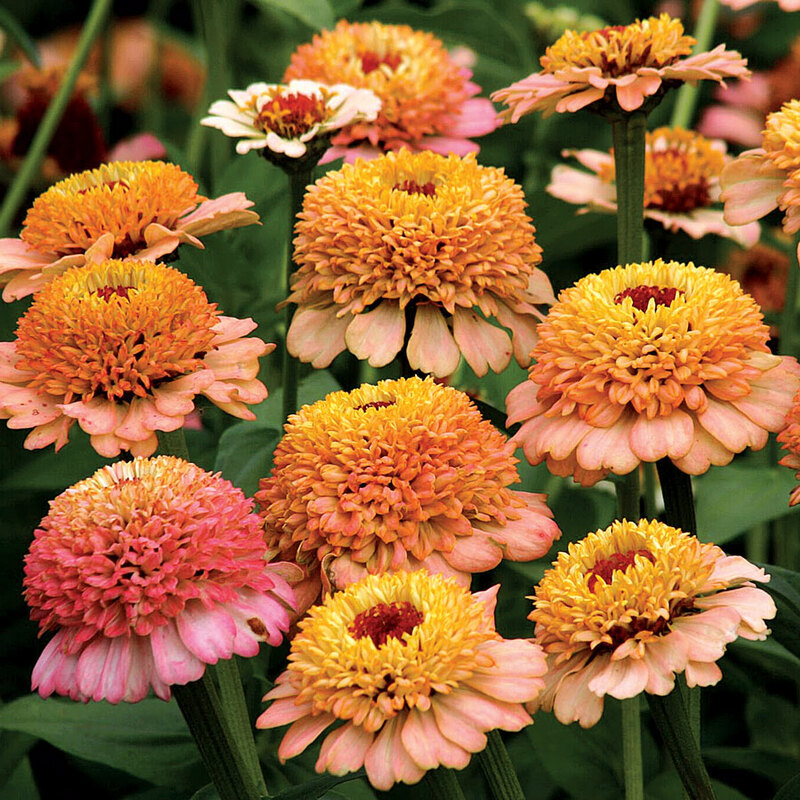 To extend their season plant early,mid and late bloomers. That will prolong their bloom season. Instead ofrepeat bloomers, plants that may send up one flower now and then, gowith those types that bloom for three or four weeks at a time but getplants that bloom at different times of the year. In Chattanooga theblooms start mid to late May and will last through early July. The budsare edible and flower blooms are used in culinary kitchens around theworld. Lori has used them as punctuators, a term Dr. Rick likes. They'renot really a focal point but they accent, they bring a lot of interestto an area. By massing them they add real zest to an area. The manydifferent colors draw attention. People are always stopping and lookingat these plants, looking at the different sizes and forms and differentvarieties. We look at several different varieties. "Broadway Gal" is smaller thanother varieties, but beautiful. Day Lilies are wonderful in flowerarrangements, even though one bloom will be gone tomorrow, the next onewill open providing new color. Select stems that have numerous bloomheads, extending the time that flower will last in the arrangement. "Elegantisma" is a beautiful yellow. "Duke of Durham" has a darkerthroat surrounded by a lighter petal with a ruffely edge. All have a bitof orange which denotes they started off as a native Tiger Lily. "Decatur Show Off" has very curled petals, a yellow throat and a veryopen form of the flower. It's very large and pretty. "Autumn Valentine"is a lovely red with a yellow throat. After they've flowered theyproduce a seed pod, these could be germinated, although Lori hasn't donethis. "Open Hearth" has a large flower that almost looks like fire. "Grape Velvet" is small, but a dark grape color that is quite unusual.Day Lilies can be transplanted any time of the year. Lori usually sticksto spring because it minimizes shock but as long as the ground is notfrozen they could be transplanted. Thank you Lori for showing us this beautiful garden. You've done awonderful job creating focal points on a grand scale. But our viewerscan utilize many of your ideas in their own yards and gardens. Thank youLori.